The beach house, small, but cosy and very well furnished. Set in large ground, with large fenced swimming pool. 3 bedrooms; 1 double , 2 single -both with pull out beds), 1 shower room, one full bathroom, living/dining area, separate modern kitchen well equipped. Next to the pool there is a lovely spacious Summer kitchen with BBQ. And a shower room. 1 separate shower room: shower cubicle, basin, and toilet. 1 full bath room: bath with shower over, bidet, basin, toilet. A shower room next to summer kitchen (shower, basin, toilet). Living dining room with TV satellite. Small but well equipped kitchen with breakfast corner, washing machine, dish washer, microwave, oven. Electric hobs and over. A short drive from Aroeira Golf Course. Outside: Large loan. Lovely Summer kitchen with B.Q. and shower room. Private fenced swimming pool ( 9,5 x 5,5m - 1,65- 80cm depth) with shower. Outdoor furniture. Cleaning / Towels / Linen / Maid service: Linen and towel included. Change of linen and towels at end of 1st week. Extra cleaning on request paid locally if necessary. This is an excellent villa for a family. The large well-manicured rear garden and the lovely swimming pool makes an ideal space for enjoying games, barbecues, etc. The accommodation is clean, adequately equipped and furnished. Satellite TV, with UK and other English-speaking channels, adds to the enjoyment. The kitchen is well equipped with microwave, electric hob, oven, fridge, washing machine and dishwasher but one thing missing is an electric kettle for making a nice cup of tea. Of special mention is the large summer house - we called it the barbecue house - where there is picnicking furniture and a built-in barbecue of great quality. It is situated at the far rear of the garden next to the pool and when opened up with wide sliding doors, is an excellent 'second house' for holding get-togethers. A big attraction is the long stretch of beach about a mile away, Fonte de Telha, is accessible by car and local bus. Lisbon is about 10 miles away, and is definitely worth a visit, with many attractions too numerous to mention. To get into Lisbon, you have to cross the '25th April Bridge' across the Rio Tejo (River Tagus), which is quite an experience. It costs 1.65 euro at the toll to cross, but only in the direction of Lisbon. Queues going across the bridge to Lisbon can be long, especially at peak times. Bullfigting is performed about 10 miles away at Montijo and the town has a charming atmosphere. The atmospheric town of Sintra (15miles away) and the Lisbon district of Belem are both charming, with ambience to whet your appetite, and very worth visiting. The owners of the villa, Maria and Fernando, are charming, friendly and helpful and they looked after our every need. The closest one - Beach Fonte da Telha approx 5km. Village - Foros de Amora 10km approx. Walking distance to restaurant, coffee shop, and supermarket. Most facilities - 10kms away - Village name Foros de Amora. Along the coast between Setúbal and Sesimbra, the Serra da Arrabida stretches up. These chalky hills have the only surviving example of primitive Mediterranean vegetation. Tucked away in the heart of Arrábida's Natural Park, the formation goes back 180 million years. 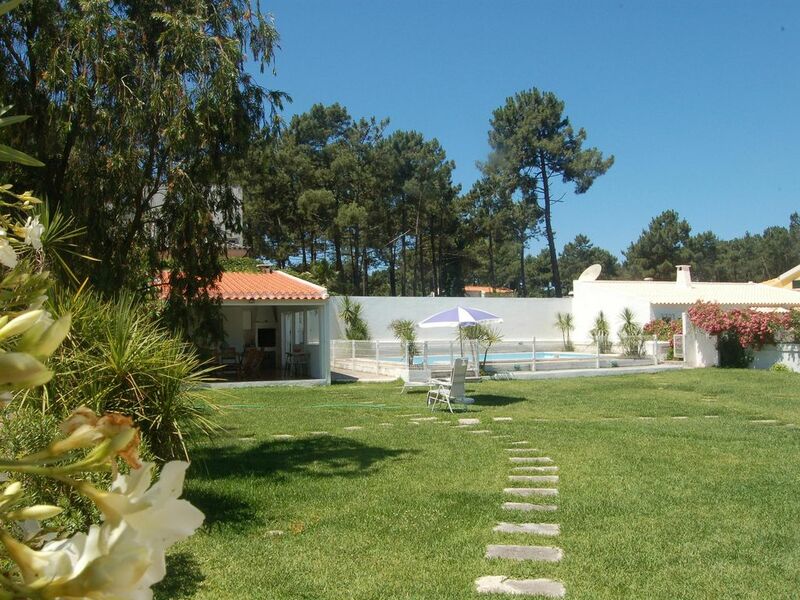 The soil and mild climatic features, considered the best in Portugal, have produced a lush vegetation rich in species. The Arrábida Natural Park was formed in 1976 and covers an area of 10,800 hectares. Setúbal, Palmela, Azeitão, Sesimbra and the sea make up its boundaries. The countryside is hilly and we can find the Serra dos Gaiteiros, S. Luís, S. Francisco, Louro, Risco along with the highest hills, the Serra da Arrábida which stands at 499 metres high. This ends abruptly and cuts into the sea, providing a scene of picturesque beauty with the lush green vegetation and the chalk white face of the cliffs, such beauty which inspired poets like Sebastião da Gama. On the coast, between the sandy beaches and clear water, up above, breeding grounds for birds of prey abound and one can also find a typical maritime flora which extends as far as the Serra do Risco, the highest coastal point of continental Portugal (300 metres above sea-level). In Creiro, around the Pedra da Anicha, an island traced above the sea leads us to the only zoological reserve of the Natural Park, named so because of the value of underwater plant species found there.